Our cardiovascular system deserves a break—not a breakdown. Our hearts work 24 hours a day, with no time off for good behavior. During a lifetime, a human heart will pump 55 million gallons of blood through nearly 60,000 miles of blood vessels, delivering essential nutrients and oxygen to trillions of cells. We can give this system a highly deserved break by eating a healthy diet that contains an abundance of essential nutrients, regular aerobic exercise and the revolutionary support of 4Life® Transfer Factor Cardio. Transfer Factor Cardio provides comprehensive support for the cardiovascular system. In addition to promoting specific system support with the power of Targeted Transfer Factor, it contains additional ingredients such as magnesium, arginate, red rice yeast extract, B vitamins and antioxidants to help support healthy blood pressure and cholesterol levels*—all necessary for healthy cardiac function. 4Life Transfer Factor products are featured in the Physicians Desk Reference For Nonprescription Drugs and Dietary Supplements since 2003, the standard supplement guide for physicians that can be found in virtually every physicians office, hospital, and pharmacy in the United States. 4Life Transfer Factor Cardio targets the superior immune-enhancing benefits of transfer factors to directly support the cardiovascular system. 4Life Transfer Factor Cardio is backed by a patented process proprietary to 4Life. (US Patent 6,468,534). This product addresses total cardiovascular health, including supporting normal inflammatory response within the body, and protecting the health and integrity of the entire cardiovascular system. Recent research shows that promoting healthy homocysteine levels may be just as important as cholesterol for a healthy cardiovascular system. B vitamins, including folic acid, B6, and B12, support normal homocysteine levels. Antioxidants such as selenium, copper, zinc, and vitamins A, C, and E, have also shown to have beneficial effects for promoting healthy homocysteine levels within the body. 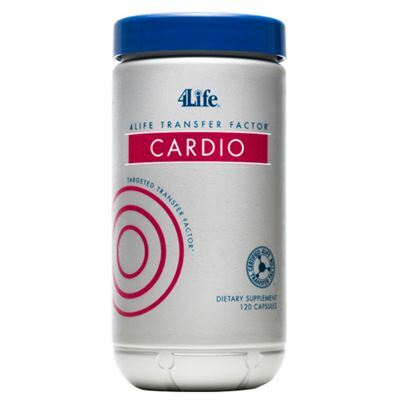 Ascorbic acid, niacinamide, hawthorn, resveratrol, garlic, lysine, and red rice yeast extract are included in 4Life Transfer Factor Cardio to support proper circulation and healthy cholesterol levels. Cardio Targeted Transfer Factor, Vitamin A, Vitamin C, Vitamin E, Niacin, Vitamin B6, Folate, Vitamin B12, Magnesium, Zinc, Selenium, Copper, Potassium, and Proprietary Blend (Butchers Broom, Ginkgo biloba, Hawthorn, Garlic, Coenzyme Q-10, Red Rice Yeast Extract, Resveratrol, and Ginger Oil). "I have a very busy lifestyle and for several years I’ve had concerns about my general health and cardiovascular system concerns based upon the health history of my parents. I have been taking 4Life Transfer Factor Cardio for four months now. I feel like this product is supporting both my immune and cardiovascular systems. I feel energized, which has greatly improved my moods and lifestyle as I get through my many activities with more ease. I am pleased that I have found a product which supports my immune system, as well as offering extra support for the health of my heart." "I started using 4Life Transfer Factor Cardio shortly after it came out. At the time, I was exercising three times weekly at the Cardiac Rehab Center. I believe that this product has helped support my cardiovascular system. I appreciate the tremendous research and development team that our founders had the vision to bring together. They are unequalled in the industry." I started out taking RiteStart Women and 4Life Transfer Factor Plus Advanced Formula in August 2004, and added 4Life Transfer Factor Cardio and ReCall in October of that year. Transfer Factor Cardio has greatly supported my healthy blood pressure levels and blood vessel integrity.